FORE! Jo and Kevin Hawke found this readerboard sign in front of the Squire Armory in Danville, Virginia. The photos represent BOTH sides of the sign, so it's no fluke. The frequency of lowercase L's used in lieu of uppercase L's on readerboards makes me wonder if the readerboard manufacturers simply don't distribute enough uppercase L's in the packages, and maybe it's not the fault of the sign authors. 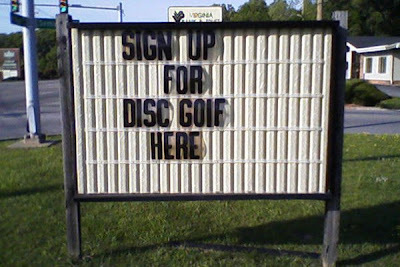 Sign up? Unfortunately, this should be a sign down. This is fun letters, Have a nice day! Uppercase it must be! I love your blog, and have given you an award. Check it out at my blog (http://therantsinmypants.blogspot.com). Just dropped by after seeing your link at The Punctuator's blog. 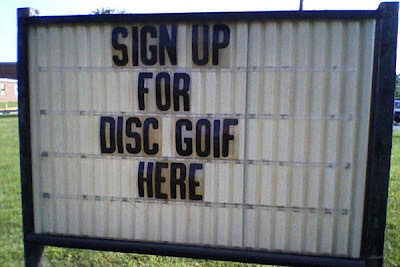 I wouldn't sign up for goif even if it was discounted. It sounds like some kind of disease. My graphic design teacher in college had famed type designer Ed Benguiat come and do a lecture. I remember vividly him showing us outdoor signage with this kind of stuff going on.